Rejoin the ranks of the most unholy Saints around as you return to the Row to experience gang life, post-fame. Kids are kicking around in Saints sneakers, tough-guy hopefuls are slurping Saints energy drinks and storeowners are proudly displaying Johnny Gat bobble heads on their top shelves. Celebrity status has hit — but will the Saints survive their newfound glory unscathed? 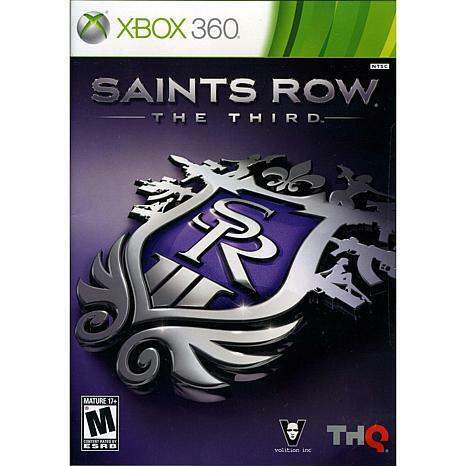 In Saints Row: The Third, fame and fortune come at a bittersweet price for the kings of Stilwater. Faced with serious demands from the legendary criminal fraternity, the Syndicate, the Saints must hit the streets of Steelport to trample their new rivals — and defend their status. Get ready for intense action, grueling gang violence and outlandish situations to spare as you take on a decaying city of sin in an all-new battle with the Saints. Buckle up and take a massive tank on a wild ride — through the sky. Duke it out against trained military forces and call in a strategic airstrike on a Mexican wrestling gang. With grit and guts galore, you and your gang will never kneel to an enemy. After all, just because you're a Saint doesn't mean you have to behave. Ages 17 and older.